Walkers are pushing themselves further than ever, seeking longer and more challenging hikes and keen to try more action-packed itineraries, according to gourmet hiking specialist, Hedonistic Hiking. The company has increased the number of the top grade 5 tours in Italy for 2019: there are now four of the highest-level tours to choose from, taking in some of Italy’s most spectacular mountain ranges, including the little-explored Maritime and Cottian Alps on the French border, the Gran Paradiso and Mont Blanc mountain ranges, and the Dolomites. Also new for 2019 is the addition to the website of sample menus which give a flavour of the gastronomic element of each tour, and a series of videos designed to assist holidaymakers with their tour choice. 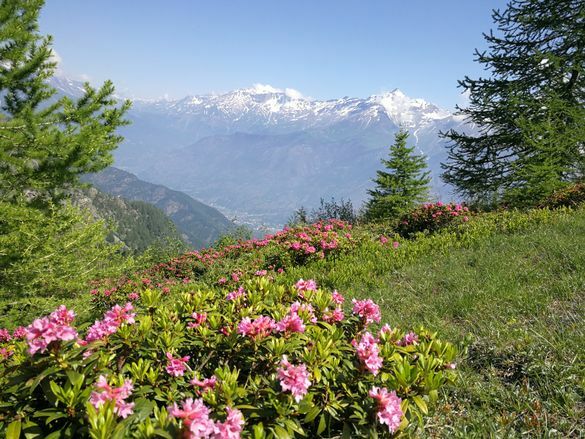 The new Mountains of Piedmont (grade 5) tour combines challenging alpine hiking amidst spring flowers with the gastronomic treats and world-class wines of Piedmont. The 8-night tour includes hikes through larch and beech woods, past abandoned stone hamlets and across alpine meadows and streams, with gourmet picnic lunches packed with Piedmontese specialities hiked in by the guides. Other highlights include visits to the Benedictine abbey of Novalesa and the mountain-top abbey of Sacra di San Michele. The longest hike on the tour is 15km. The 8-night all-inclusive guided tour costs €2995pp including accommodation, picnic lunches, gastronomic dinners with wine, activities and transfers, with Hedonistic Hiking (www.hedonistichiking.com, 01858 565148). Food and wine are every bit as important as the walking on a Hedonistic Hiking holiday. Guests can now get a taste of what to expect by checking out the sample menus on the website prior to booking. All Hedonistic Hiking tours focus on the regional gastronomy: guests learn much by walking through the landscape, past vineyards, orchards and fishing ports but also by spending time with cheesemakers, truffle hunters and wine-makers. Dining experiences vary from small characteristic osterias to Michelin-starred restaurants with big reputations. See Sample Menu here. Several of the tours include cookery classes. Guests can learn how to cook typical Abruzzese dishes in Santo Stefano and Tuscan specialities in the Siena countryside. Each 7 or 8-night tour is fully-inclusive, including guided walking, gourmet picnic lunches, gastronomic dinners with wine, museum visits and food/wine tastings or cookery classes, and airport transfers. Accommodation is in hand-picked, locally-owned hotels. In several locations, guests stay in Italy’s distinctive ‘alberghi diffusi’, an initiative which supports the conversion of empty or abandoned homes in a rural village to provide ‘scattered’ rooms, rather than building a new hotel. Flights are not included. Hedonistic Hiking tours are available in the Dolomites, the Alps, Piedmont, Friuli, Emilia Romagna, Tuscany, Umbria, the Basilicata, the Abruzzo and the Italian Lakes, with several of the tours crossing borders into France, Slovenia and Austria. Hedonistic Hiking was established in 2007 by Jackie and Mick Parsons. Tours are led by either Jackie or Mick, supported by an experienced, knowledgeable team. Further information from Hedonistic Hiking (www.hedonistichiking.com, t. 01858 565148).